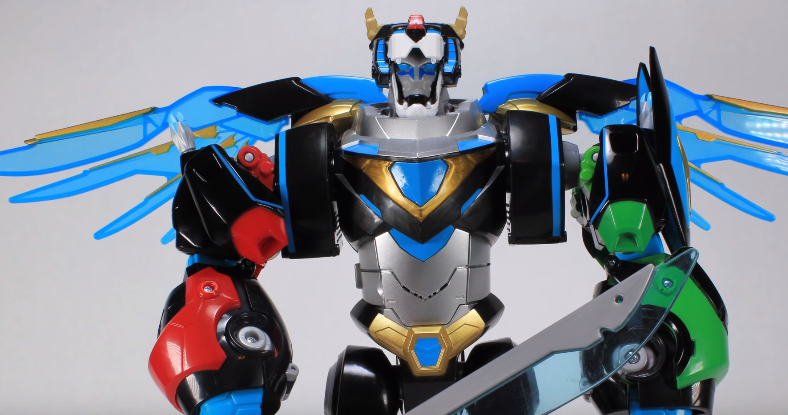 Playmates Toys is ready for Voltron fans to experience a brand-new Legendary Defender Hyper-Phase Voltron 5-Piece Gift Set Action Figure – SDCC 2018 Previews Exclusive. It is limited to only 3000 units and offers an exciting new addition to your Voltron collection. I was provided a free Legendary Defender Hyper-Phase Voltron by Playmates Toys for review. The opinions are my own. My friend was very excited because I let him take the set out of the packaging it was delivered in before I could. Even though he isn’t a Voltron fan, he agreed the figures looked very cool, especially because of the Hyper-Phase blue paint job. 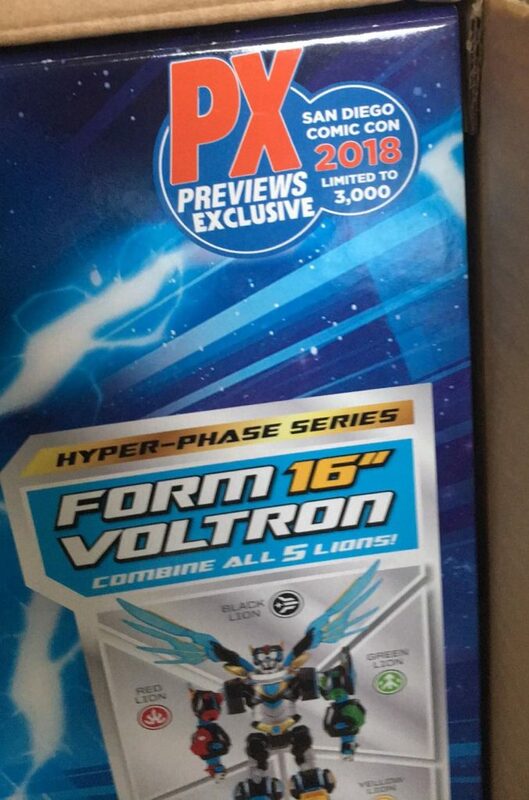 The first thing you will notice is the awesome box the Legendary Defender Hyper-Phase Voltron set comes in. It even has a plastic handle because you will need it to carry the box around on the convention floor if you buy it at SDCC 2018. The front flap flips upward to reveal a window box which showcases the lions and the accessories this set comes with. 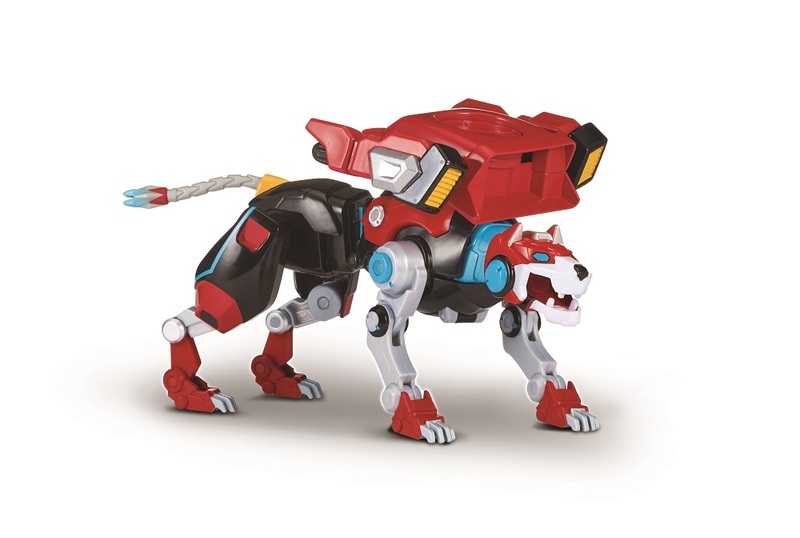 The legend comes alive when the Legendary Lions are combined to form the unbeatable Defender of the Universe – Voltron. 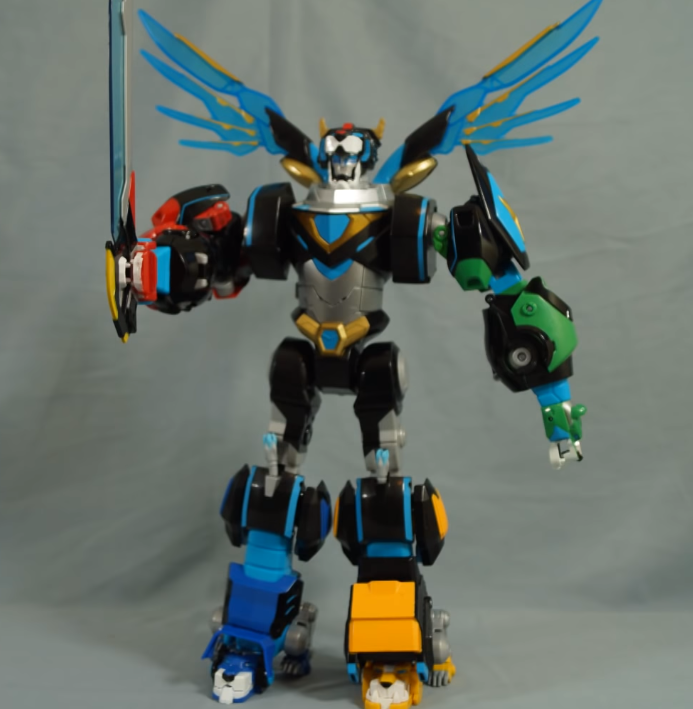 These five powerful Lions transform and combine to create a towering 16-inch Voltron action figure featuring lights and over 50 phrases and sound effects from the DreamWorks series Voltron: Legendary Defender. Limited to 3,000 pieces worldwide, the Voltron: Legendary Defender Hyper-Phase Voltron 5-Piece Gift Set Action Figure – SDCC 2018 Previews Exclusive also includes the Quintessence-enhanced projectile launchers! Voltron was built to harness the mysterious Quintessence energy and establish peace and harmony throughout the universe. Faced with the Galra’s innumerable armies, the Voltron team taps into Princess Allura’s unique connection to the Quintessence and imbues the Lions with this energy, upgrading their weapons systems and supercharging this robotic defender! This gift set is very similar to the already released Legendary Defender Voltron figure from Playmates Toys. The thing that helps it to stand out is the new paint deco which makes use of the Hyper-Phase shade of blue. 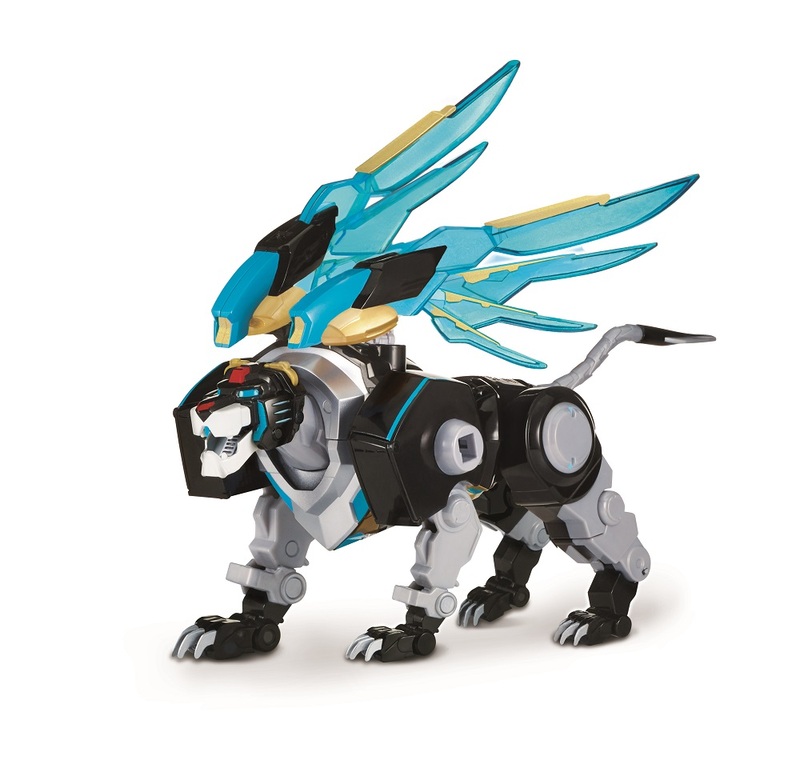 Other than that, the Black Lion also comes with articulated wings. These translucent wings give the completed Voltron figure, which stands 16-inches tall, a very cool look. All of the lions come with their respective Paladin shuttles. The pilots are all painted black. However, the shuttles have different molds and coloring. The claws of the lions are made of soft plastic for safety reasons. Each lion, except for the Black Lion, comes with new attachable cannons which help add to the play-value of this set. The build is sturdy. However, I won’t throw the figures around too much during playtime. Let’s go over each of the lions! 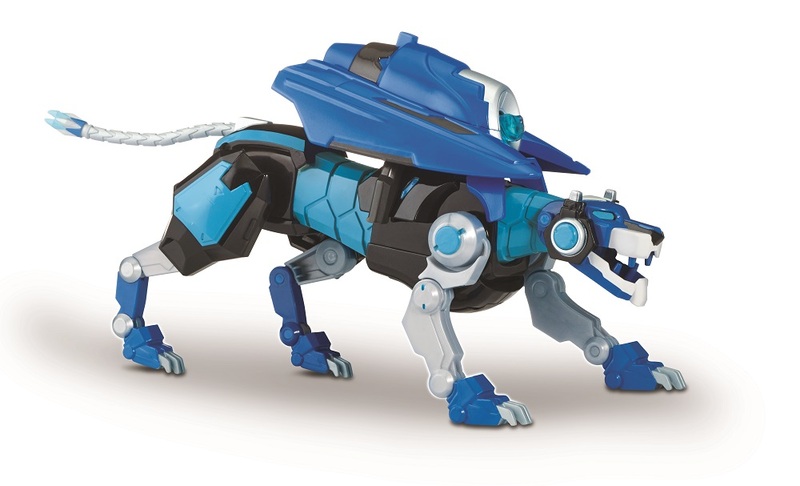 Similar to the Legendary Defender Voltron figure from Playmates Toys, the Blue Lion is highly-articulated. The legs can move at the hips, knees, and ankles. The front legs can move at the shoulders, elbows, and wrists. Furthermore, the mouth snaps shut. You can also move the head up and down. The cannon attaches to the upper back portion of the figure. There is a button at the top of the cannon which shoots a single missile. The Hyper-Phase paint job can be seen on the torso, a couple of blue strips on the hips, neck, and the face. To prepare the Blue Lion for creating Voltron, simply fold up the front legs. The hind legs fold up, too. Push the tail in. Pull up the flap covering the neck and fold the head up. Now bring down the front limbs a bit to serve as Voltron’s heels. 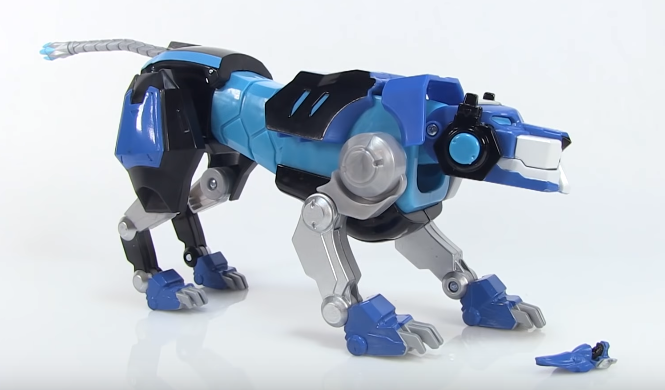 The articulation is the same as the Blue Lion. The Hyper-Phase blue covers the figure’s neck, torso, neck, and the hips. This lion comes with a cool-looking dual-cannon which attaches on the back. Each canon has a button for shooting a single missile from each. 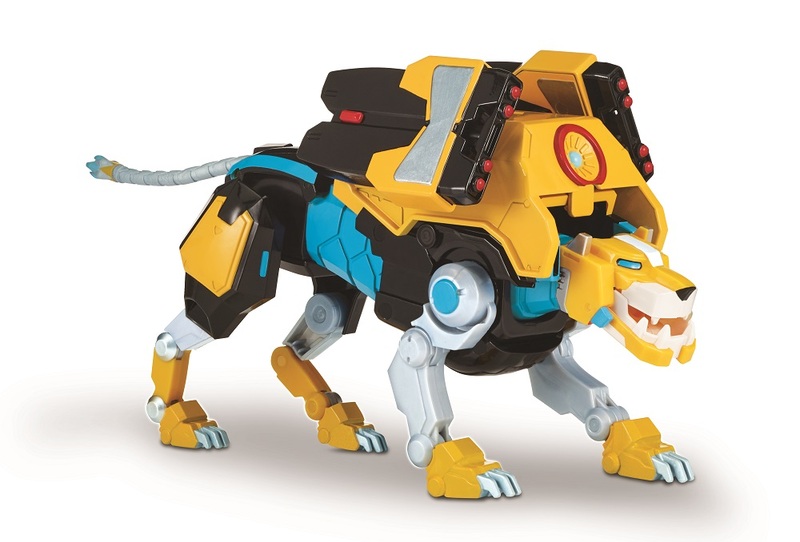 Follow the Blue Lion’s directions to prepare the Yellow Lion for making Voltron. The Red and Green Lions are smaller in size than the Blue and Yellow figures. The Hyper-Phase blue on the Red Lion is visible on its middle joint (the torso), neck, and cheeks. Again, it is a very articulated figure with added movement in the mid-section which the Yellow and Blue Lions don’t have. The Red Lion comes with a disc-launcher canon which attaches on the back. Just squeeze the sides of the cannon to shoot a disc. To prepare the Red Lion, push in the tail. Fold up the hind legs. Open the torso flap from above and fold in the front legs. Close the torso flap. Pull out the small peg from under the figure. 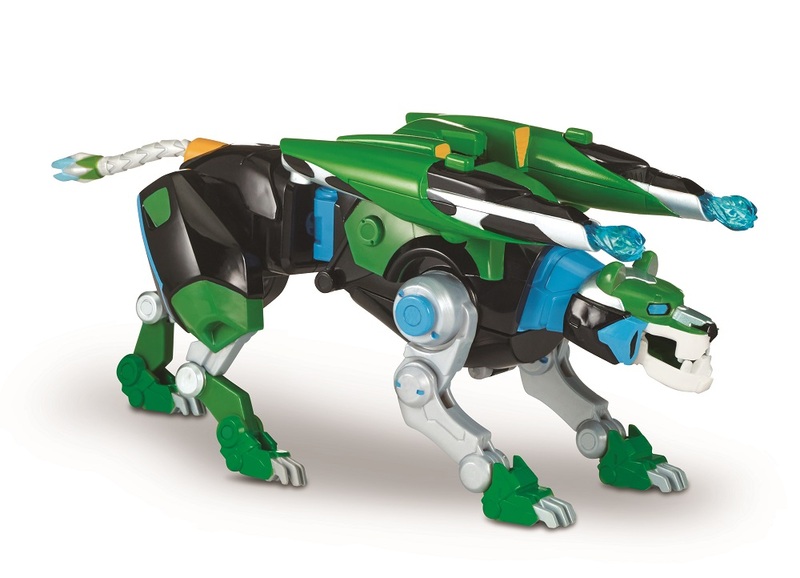 The Green Lion comes with Voltron’s shield which you can attach to its back. The articulation is the same as the Red Lion. To attach the cannon you will need to take away the shield. The Green Lion’s cannon has two buttons on the top with each button shooting a single missile. The Hyper-Phase blue is the same as the Red Lion. Also, the Hyper-Phase blue, for some reason, looks awesome with the Green deco on this figure. Follow the Red Lion’s directions for the Green Lion to make Voltron. Do take off the shield before you begin preparing it. Once the Green Lion has been prepared the shield can be attached to the portion which serves as Voltron’s shoulder. The Black Lion doesn’t have a lot of the Hyper-Phase blue on its body. You can see it as blue strips on the shoulder blades and some on the face. The articulated wings, on the other hand, look gorgeous because of the Hyper-Phase blue. The wings can swivel as well as move up and down. A button is present on the side of the figure’s torso which activates the voice chip to produces more than 50 sounds. The voice chip is similar to the Legendary Defender Voltron figure. If you have been following the Netflix TV series, you might wish the voice chip was changed to relate more to the series considering how the pilots for the Lions have changed with time. To prepare the Black Lion you will need to open the shoulder slots and fold in the front legs. Close the slots and turn them in such a manner that the front legs are facing the back. Extend the hind legs all the way so they become straight. Also, fold up the tail to touch the back. The mouth can open to reveal Voltron’s face. There are small pieces at the top of the head you can extend. The Black Lion is able to detect the lions you attach and make related sounds. For example, if you have attached the Blue, Green, and Red Lions, it will let you know the Yellow Lion still needs to be attached if you press the button on the side. Of course, you can turn off the voice chip if you don’t want to continue hearing all of the sounds. Voltron’s weapon is a sword (which is the same as the Legendary Defender Voltron figure). The figure itself is also very articulated. It has bendable knees. You can swivel it at the thighs. The legs can move at the hips. The arms move at the shoulders and bend at the elbows. You can also move the wrists. However, the head doesn’t move. This Voltron Hyper-Phase exclusive will be available for purchase during SDCC 2018 from Entertainment Earth booth #2343. You can go ahead and pre-order it, too. The entire set will cost you $129.99. Do keep in mind that your order will be filed and shipped in August if supplies last after the show. This exclusive set will also be available at ThinkGeek/Gamestop booth #3349, Toynk Toys booth #815/4437, and Trendsetters/Sure Thing Toys booth #4730. Make sure to keep up with our coverage of San Diego Comic-Con 2018 and Voltron animated series on Netflix. 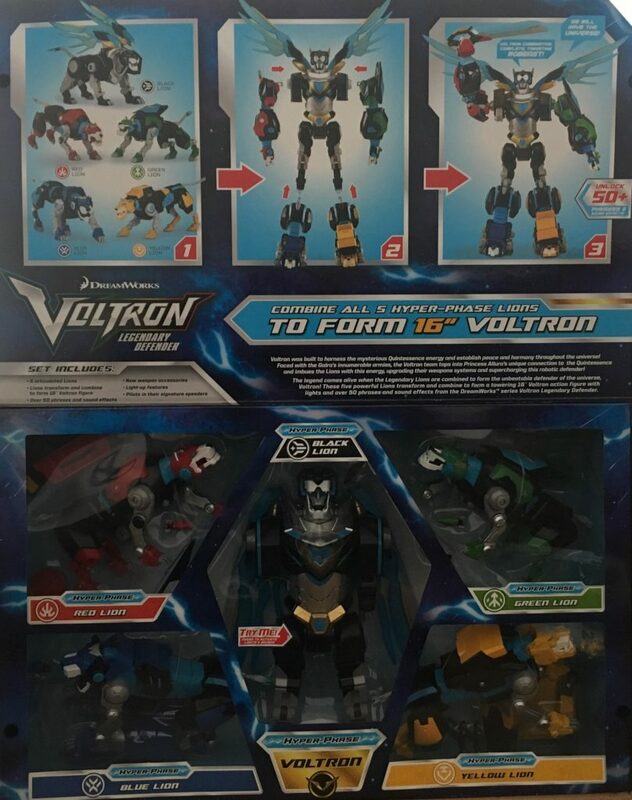 Will you be picking up the Legendary Defender Hyper-Phase Voltron 5-Piece Gift Set Action Figure – SDCC 2018 Previews Exclusive? Let us know.